Buying a house isn't easy. Sometimes you can feel like a dizzying set of guidelines and procedures, especially now banks have tightened up their lending rules as non-performing loans have increased. Because of this, it's important to find out why your loan application was denied. Here are some common reasons why your loan request can be denied. The banking industry has embraced the use of advanced technologies to serve its customers more quickly and with greater accuracy. One of the major changes that has occurred in the banking industry is the utilization of computers to underwrite mortgage loans. In the past, traditional underwriting process was performed by humans. However, as with many functions, computers can perform these functions faster, more accurately, and can also reduce human error or negligence in the underwriting process. Application scoring is a system used by banks to determine the risk grade and decide how much to lend to customer. Whenever the bank officer receives a loan request, they will enter customer's personal information into the application scoring system, which analyses the customer's profile such as customer's age, education level, marital status, occupation, income, nature of business, etc. Each fact will be given points based on information that have provided by applicant, all the points are added together to give a score. Different banks have different underwriting guidelines to work out application scores. There are a number of factors that a financial institution will take into account when they consider your application for a mortgage loan, and it has been proven that occupation has been one of the important factors when evaluating your loan application. Blue collar worker - Person who performs manual labor works at the work place, e.g. technician, restaurant cook, driver, waiter, manufacturing or production operator, maintenance worker, constructions worker, installation or repair worker, gardener, beautician, hairstylist, etc. Banks will look at the sector or industry you are employed and whether is it especially exposed in economic recession. And also the overall market conditions or fluctuation may affect certain sectors or industries such as oil & gas, transport & logistics, airline, etc. It is worth mentioning that there are some of the borrowers from certain sectors or industries had a poor payment records in the banking system, so banks will reject the loan application if there is a loan request from the same sectors or industries, based on past history summary and analysis. This is because some of the banks believe that if there is a financial crisis or global recession occurs, the white collar workers are more confident to find a new job, and it’s also according to statistical analysis based on past banking data. Remark: Employment stability is important as most banks prefer borrowers to be with their current employment for at least three or six months and not on a probationary period if possible. CCRIS stands for Central Credit Reference Information System created by Bank Negara Malaysia (BNM). 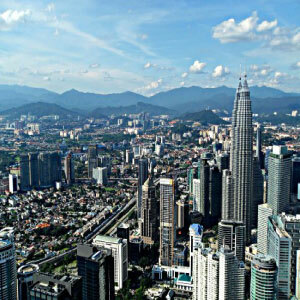 All participating financial institutions in Malaysia are required to submit a monthly credit report of all their borrowers to the Credit Bureau Malaysia, all the credit information that have been collected is stored in a computerized database system known as the Central Credit Reference Information System (CCRIS) which contains credit information on about 9 million borrowers in Malaysia. CCRIS automatically processes the credit information received from the participating financial institutions and compile it into reports consistently, make it available to the financial institutions upon request. CCRIS report is a summary of your credit payment history and banks will use your CCRIS report when evaluating your credit risk and deciding whether or not to approve you for loan. There are a total of 1.25 million borrowers who failed to repay their PTPTN loans have been listed on CCRIS beginning 2015. If you don’t pay your PTPTN loan, it can quickly damage your credit score. A good credit score record can make it possible to buy your dream home or car, so the best way you can do is make payment on time to improve your credit scores. Credit facilities under the close supervision or monitoring by the financial institutions, such as Non-Performing Loan (NPL) or credit facilities under the AKPK’s Debt Management Program (DMP). AKPK stands for Agensi Kaunseling dan Pengurusan Kredit, also known as Credit Counselling and Debt Management Agency. An agency was set up by Bank Negara Malaysia (BNM) to help individuals who are facing difficulties servicing their outstanding debts as well as financial counselling help individuals take control of their financial situation and gain peace of mind that comes from the wise use of credit. The AKPK counsellors will work with the borrowers to develop a personalized debt repayment plan and resolve financial problems with the financial institutions. Generally speaking, bank will not approve application for those under Special Attention Account. If you do not have any payment history record, it can affect your credit score. This may seem unfair, but the reason is that you have not established past payment history to show that you have the discipline to make payment, banks look for a consistent history of paying your loan on time. Mr. Lee began his career as a software engineer for a multinational company after graduation. He has been promoted to manager within a short period of time, his monthly salary has been increased from RM 3,500 to RM 6,000, and he started making enough money to splurge. Meanwhile, he has three credit cards with higher credit limits, and he started spending money on luxury products and unnecessary things. Because of his attitude, he's owed more than RM 30,000 within a year and failed to make the credit cards payment on time. One year later, Mr. Lee and his wife decided to buy an apartment, they have applied loans with different banks. Unfortunately, all applications have been turned down because of an unsatisfactory credit history. Madam Chen has more than 10 years of experience in the stationary trading business, and she intends to expand her business into other areas. However Madam Chen needs some extra cash to increase her capital and to expand her business, thus she decided to apply for a loan from banks. One week later, she received a letter saying that the loan has been denied. She was surprised by the result and was informed by the loan officer that she has been blacklisted for being a guarantor to borrower who defaulted on payments. As cases mentioned above, we can realize that it's so important to manage your creditworthiness, usually bank will determine your creditworthiness based on your credit report. It's a good idea to have your credit report before you start your loan application, so you have time to find out and fix any mistakes on your credit report. Debt Servicing Ratio (DSR) is the percentage of a borrower's monthly net income that is spent on debt payments, and provides an estimate amount that you may be able to borrow. Banks use the Debt Servicing Ratio to measure your ability to manage the debts, with a low Debt Servicing Ratio shows you have a good balance between debt and income. Banks want to make sure that you can afford to pay them back and you’re not overwhelmed with too much debts before they give you a loan. This also may reduce the bad debts or Non-Performing Loans (NPL) ratio. When applying for a mortgage loan, banks will need proof of income to ensure that you have sufficient monthly income to cover your mortgage loan payments and will consider your total monthly income from all sources e.g. include salary, OT, bonus, allowance, rental income, dividend, etc. 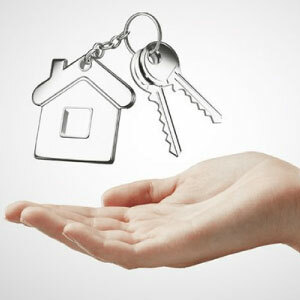 Your current income will also be a significant determining factor in loan approval. Banks will want to see that you're currently working, it is a very important step in determining the eligibility for a loan. 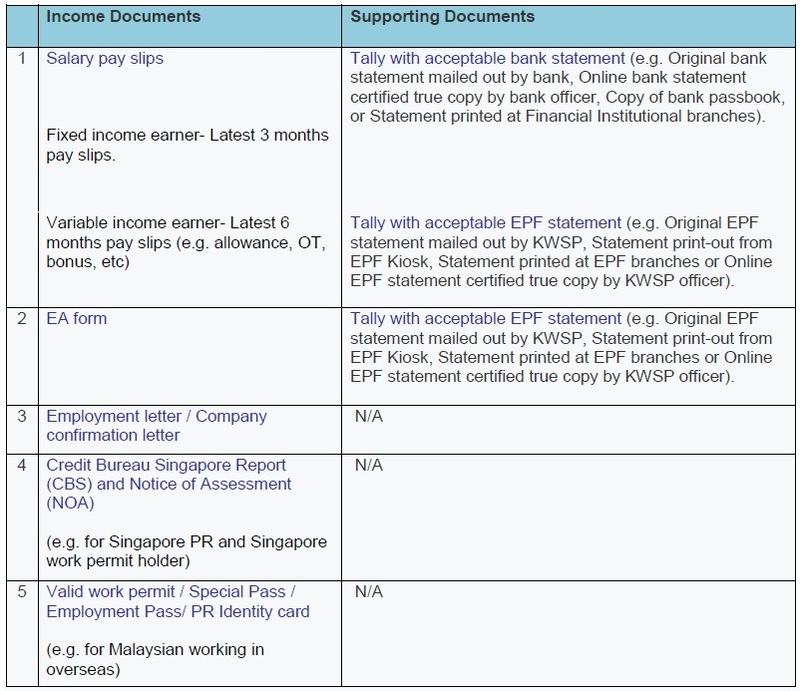 Most of the documentation should be similar if you have applied to several banks, so you should prepare all your documents as early in the process as possible. 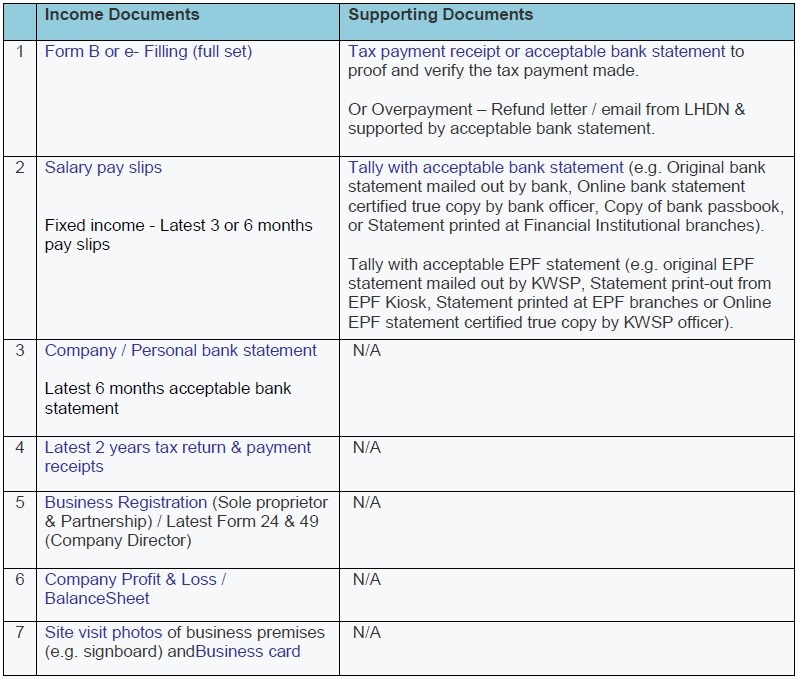 Below are some of the basic documents that you’ll need to prepare to effectively get your loan. Bankruptcy is the legal procedure for a person unable to pay off his outstanding debts of at least RM30, 000.00, it is a status that can only be granted by court. Once a person has become bankrupt (bankruptcy order is made by the court), the Director General of Insolvency (DGI) will become the administrator of his assets or properties, and will repay or distribute fairly to the creditors once the assets or properties are sold. Most of the banks would not even consider lending money to someone with bankruptcy. Banks might want more information than just CCRIS banking payment history before approving a mortgage, including credit information from third party data. Banks will carry out a credit assessment of the borrower from various sources, such as credit information provided by the Credit Reporting Agencies (CRA) registered under CRA Act, namely RAM Credit Information Sdn Bhd, CTOS Data Systems Sdn Bhd, Credit Bureau Malaysia Sdn Bhd, FIS Data Reference Sdn Bhd, BASIS Corporation Sdn Bhd and Dun & Bradstreet (Malaysia) Sdn Bhd. Credit Reporting Agency (CRA) is a company that collects and analyzes credit related information on individual consumers or on businesses for variety uses. The data are collected from various sources, while CRA offer many services to the public and companies that seek consumer information. Lending industry is a risky business. Basically, the lending institutions like banks, motor vehicle dealers, telecommunication companies, and other creditors will use all available credit information to help them make their lending decisions. Lenders will determine your creditworthiness based on your credit report as they need to minimize risk as much as they can. The Credit Reporting Act 2010 promotes fairness, accuracy and privacy in the practice of creditReporting, and you have the right to access your credit report to verify the accuracy of information reported in your credit report. For your information, the Credit Reporting Agency is not allowed to contain information about the individual bankruptcy status two years after the date of discharge of bankruptcy or the date of final settlement.You may check your report from credit reporting companies. Mr. Kumar graduated from Aviation Maintenance Academy two years ago, and currently working as an aircraft maintenance engineer. He decided to buy a house with his fiancée before getting marriage. Unfortunately, his loan application has been declined, and he found out that he has been blacklisted by a motorcycle dealer who offer in-house finance to him. He purchased the motorcycle with that dealer when he was studying at university, and he failed to make full payment to the dealer after graduation. Ms.Siti was unable to get home loan because of her blacklisted status. She has been blacklisted by telecommunication company due to there is an outstanding balance of RM 600 on her account which registered since 2009. Finally, she had realized that her brother used her name to register an account with that telecommunication company. Generally speaking, it’s important to have a positive credit history, the better your credit history, the more likely to lend you money. 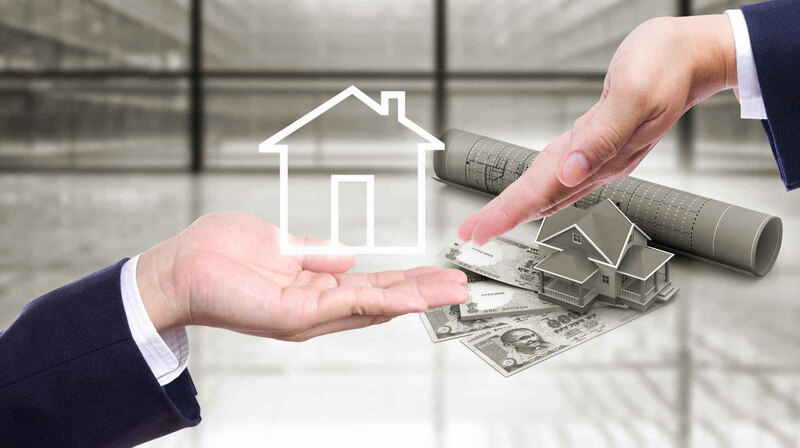 Having a good credit score and stable job or good income are the primary factors that banks will look for when you apply for a mortgage, other than that, banks will also take into consideration the developers and locations you have chosen. It's important to make sure you are buying from a reputable developer as there’s threat of a developer failing to complete construction (abandoned projects) within the timeframe. For under construction property projects, the developers are required to submit end-financing / empanelment (an arrangement with a project developer to provide financing to the buyers) documents to the banks that they wish to apply before banks can provide financing to the buyers. In other words, the home buyers can only borrow money from the approved end-financier or panel banks. - Any negative factors may affect the marketability of the projects, etc. 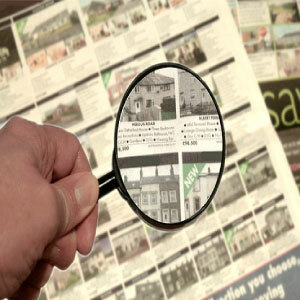 - Other factors which may affect the marketability of the property, etc. Remark: If a seller is bankrupt or under bankruptcy proceeding status, the loan also can be rejected, it is because the court will appoint the Director General of Insolvency (DGI) to administer the bankrupt’s assets or properties in order to settle the outstanding debts to his creditors.